Here's a chart released by Assassin's Creed/Watch Dogs/Splinter Cell publisher Ubisoft today. That'd be the publisher that put out a bunch of games for Wii U last year, including the superb launch-day exclusive ZombiU but now doesn't want to do more exclusives until Nintendo sells more systems. In this chart, "Q1 2013/2014" is April 1-June 30, 2013. 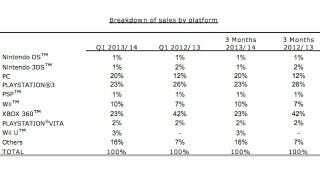 The Wii U wasn't out during Q1 2012/2013. It came out in November of 2012. The other consoles have at least six years on it. Ubisoft is releasing a bunch of non-exclusives on Wii U over the next few months, including Cloudberry Kingdom, Splinter Cell: Blacklist, Assassin's Creed IV: Black Flag, Rayman Legends, Just Dance 2014 and Watch Dogs. They may in fact be the third-party publisher that is releasing the most games for Wii U this year. At E3, Nintendo of America president Reggie Fils-Aime told Kotaku that Nintendo's upcoming games from mega-franchises like Super Mario, Zelda, Mario Kart and eventually Smash Bros. should help build the Wii U installed base.